"The practical applications of this revolutionary principle have only begun. So far they have been confined to the use of oscillations which are quickly damped out in their passage through the medium." "What will be achieved by waves which do not diminish with distance, baffles comprehension"
"This is not merely a theory, but a truth established in numerous and carefully conducted experiments. When the earth is struck mechanically, as is the case in some powerful terrestrial upheaval, it vibrates like a bell, its period being measured in hours. When it is struck electrically, the charge oscillates, approximately, twelve times a second. By impressing upon it current waves of certain lengths, definitely related to its diameter, the globe is thrown into resonant vibration like a wire, stationary waves forming, the nodal and ventral regions of which can be located with mathematical precision. Owing to this fact and the spheroidal shape of the earth, numerous geodetical and other data, very accurate and of the greatest scientific and practical value, can be readily secured. Through the observation of these astonishing phenomena we shall soon be able to determine the exact diameter of the planet, its configuration and volume, the extent of its elevations and depressions, and to measure, with great precision and with nothing more than an electrical device, all terrestrial distances". "By proper use of such disturbances a wave may be made to travel over the earth's surface with any velocity desired, and an electrical effect produced at any spot which can be selected at will and the geographical position of which can be closely ascertained from simple rules of trigonometry". "This mode of conveying electrical energy to a distance is not 'wireless' in the popular sense, but a transmission through a conductor, and one which is incomparably more perfect than any artificial one. All impediments of conduction arise from confinement of the electric and magnetic fluxes to narrow channels. The globe is free of such cramping and hinderment. It is an ideal conductor because of its immensity, isolation in space, and geometrical form. Its singleness is only an apparent limitation, for by impressing upon it numerous non-interfering vibrations, the flow of energy may be directed through any number of paths which, though bodily connected, are yet perfectly distinct and separate like ever so many cables. Any apparatus, then, which can be operated through one or more wires, at distances obviously limited, can likewise be worked without artificial conductors, and with the same facility and precision, at distances without limit other than that imposed by the physical dimensions of the globe". "Millions of such instruments can be operated from but one plant of this kind. More important than all of this, however, will be the transmission of power, without wires, which will be shown on a scale large enough to carry conviction"
"Mr. Nikola 'Tesla has announced that as the result uf experiments conducted at Shoreham, Long Island, he has perfected a new system of wireless telegraphy and telephony in which the principles of transmission are the direct opposite of Hertzian wave transmission. 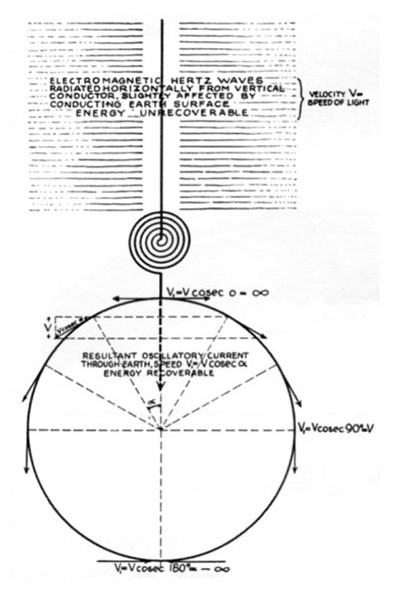 In the latter, he says, the transmission is effected by rays akin to light, which pass through the air and cannot be transmitted through the ground, while in the former the Hertz waves are practically suppressed and the entire energy of the current is transmitted through the ground exactly as though a big wire. Mr. Tesla adds that in his experiments in Colorado it was shown that a very powefull current developed by the transmitter traversed the entire globe and returned to its origin in an interval of 84 one-thousandths of a second, this journey of 24,000 miles being effected almost without any loss of energy". The earth’s diameter passing through the pole should be an odd multiple of the quarter wave length – that is, of the ratio between the velocity of light – and four times the frequency of the currents. M = D/(1/4 lambda) where lambda = c/f = 4D/M and M is the odd multiple. C = speed of light at 299,792 km/sec. D = Earth diameter at 12,742 km. "It is necessary to employ oscillations in which the rate of radiation of energy into space in the form of Herzian or electromagnetic waves is very small. To give an idea, I would say that the frequency should be smaller than twenty thousand per second, though shorter waves might be practicable. The lowest frequency would appear to be six per second, in which case there will be but one node, at or near the ground-plate, and paradoxical as it may seem, the effect will increase with distance." "The earth is a conductor of electricity, and as such has its own electrical period of vibration. The time of one complete swing is about one-twelfth of one second. In others words, this is the interval the current requires in passing to, and returning from, the diametrically opposite point of the globe"